At this year's Institute for Money, Technology, and Financial Inclusion conference, many were celebrating the fourth year of the event. In introducing two days of panel, the institute's director Bill Maurer explained how at its inception the group had capitalized on the fact that there was "a lot of excitement about the potential of mobile money services" as well as some obvious deficiencies "happening on the research front," since most work on mobile money was marked by an industry perspective, or it was generated by foreign development efforts that lacked the long-term investment of time that characterized work in the discipline of anthropology, from which most IMTFI researchers come. Maurer also noted that the institute had devoted itself to "getting the perspectives of researchers from the countries" about money, savings, and remittance behavior. He explained that the institute was about much more than the model of just sending people off to do research in the field abroad and then waiting for research results to return a year later, however, because the center also has a curatorial mission that includes managing material collections, such as those on display at the current Gold to Gigabytes exhibit at the UCI Libary, as well as a duty to facilitate scholarly networking among a diverse population of researchers that included pitching an upcoming conference in Ghana. Maurer also remarked that paper was still important as a means for delivering the institute's call for research even in the digital age, so that researchers could share "how people make do and get by" and explore the "social infrastructures of money," which can also facilitate "social justice projects." The first official talk of the conference on Mobile Kin and Mobile Money: The Anthropology of International Remittances in Kenya by Sibel Kusimba focused on Western Kenya, particularly Coast Province, although Kusimba also gathered information from Kenyans in the USA who sent remittances home. 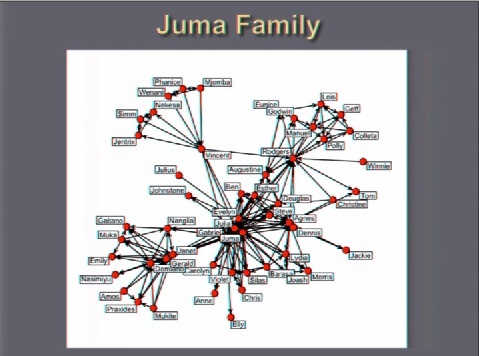 Kusimba's presentation about families in Western Kenya began with an assertion about their diversity, although more than 50% of her subjects seemed to be mobile phone holders (or have access to them), and 80% were subsistence farmers. Although savings might be facilitated by using the phone as a bank, Kusimba's interview subjects showed some ambivalence about how well it actually served as a tool for conservative money management in real world practice. Her subjects sent money to others using the phone, and they also sent airtime. Like other researchers who have presented at this conference in the past, she cited the availability in the country of M-PESA, which was founded in 2007 and currently has more than 15 million members. She characterized as "uncommon uses" some of the more potentially transformative electronic practices associated with the formal economy, such as using phones for paying business partners, paying fees and bills, and using links to banking, even though relatively advanced services made this "easy to do with Western Union," because most of her subjects didn't have enough money to take advantage of interconnectivity with the bank. Kusimba then described three kinds of payment needs: 1) urgent needs, 2) everyday expenses, and 3) social payments. She argued that requests for mobile money to meet urgent needs (transport, food, medical injury or illness, debt, airtime, school fees, etc.) tend to be made to someone the same age as the needy person, since those in crisis don’t want to worry parents or grown children. Planning for everyday expenses could begin months or years in advance. For example, a happy announcement about success on a Kenyan National Examination might cause family members to anticipate upcoming mobile money payments. She claimed that everyday expenses might include some overlapping categories with urgent needs, such as food, rent, airtime, and school fees. Social payments were also important for funerals and coming of age ceremonies, such as those for the Bugoma region. However, her subjects seemed unsure if a remittance could really substitute for the presence of a person. Kisumba also asserted the social value of airtime, particularly as a way of making a romantic overture. She agreed that mobile money could serve the aims of women's empowerment, but she observed that it had also empowered men, and she cautioned against discounting the potential social costs from personal finance practices oriented around individualism. Although mobile money might serve the needs of a Personal/Private “Me” and might empower women to make individual private decisions to go to a hair salon or send money to a mother or sister, there could be other possible effects as well. She described informants stating that “men should not have phones” and grumbling that divorces were occurring in these communities "because of M-PESA," since men could also send money with mobile phone without wife knowing. 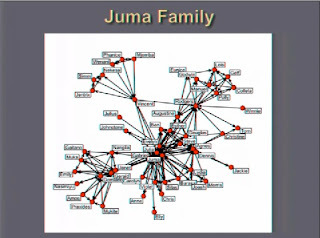 Kisumba also examined how those sending remittances might want to avoid “family politics” by choosing one individual, often the person's mother, to serve in a "broker" role and determine who needs money the most. She noted that this new role conveyed prestige and authority, which she tried to demonstrate through social network analysis. What she discovered were matrilineal networks quite unlike the patrilineal networks that determined the flows of capital in traditional society. When the father’s relatives were not very much in their lives of her subjects, new forms of social organization could emerge. She characterized mobile money transfers as routed through “uterine networks” of everyday support and cited the work of feminist anthropologist Margery Wolf's 1972 work on "Uterine families and the woman's community" as a possible framework. She argued that ROSCAs (Rotating Savings and Credit Associations) and family associations might be useful from an “I” perspective, yet people might also want to use such groups from the “we" perspective. She suggested that mobile money should be transformed into some kind of group activity, and hypothesized that text messages announcing "so-and-so has made her contribution for the month" might encourage social cohesion. The presentation that followed from Magdalena Villarreal and Isabelle Guèrin about "Generating, Storing and Exchanging Value: Comparing Financial Practices in Mexican and Indian Rural Communities" focused on presenting a comparative study of the west of Mexico with a region in India. Villarreal had done earlier work in Chiapas upon she was building as a way to understand financial instruments, and grappling with analysis of money generation, storage, accumulation, mobilization, and exchange. Villareal showed ledgers as representative of the importance of calculation in this process and "keeping things in mind and "writing notes." Guèrin followed with her interpretation of monetary behavior in Tamil Nadu in South India. Marginal farmers and landless laborers -- often in construction or local markets -- were her in population of informants. Caste was a fundamental value in these communities, and owning land, controlling housing, and possessing livestock were all status activities. There was also a deep investment in rituals. Caste was also important in structuring netwoks of debt, since the social hierarchy demanded that the creditor be above them. The recent emergence of self-help groups was also an important factor that she observed. Villareal returned to the microphone to describe work in El Grullo in Western Mexico, which was an irrigation district, and therefore within Mexico not the poorest region. Maize, sugar cane, and horticulture tied to Californian enterprises with strawberries, berries, and tomatoes were important for the local economy in which sugar cane cutters were among the poorest. Cattle were a store of value, albeit one seen as increasingly less efficient, and there was also investments in vehicles, shops, and musical instruments. (The area is famed for its music, and fifteenth birthday celebrations also require musicians.) Although it was illegal to take children to do work, residents do it anyway as part of the process of the generation of value. Production, migration, and financial practices were marked by many different kinds of resources and currencies. In thinking about monetarization and financiarization, Villareal argued that value is not just about speaking in monetary terms. She also noted that security was a factor in understanding the Mexico/India difference. Even if gold was used for saving and might have potential social capital, it was hidden to prevent it from being stolen in Mexico unlike India, where it was proudly displayed. The duo did not have time to present research on "chit funds," and discussed value mobilization and debt as they concluded, as way use resources. For them, debt functioned "as a marker of hierarchies" in larger processes of valuations. In thinking about how debt is signified, they noted that protection, exploitation, and solidarity were all possibilities, since debt also implied a potential obligation for labor. Heather Horst opened the next presentation on Mobiles, Migrants and Money: A Study of Mobility at the Haitian-Dominican Republic Border. (Horst had previously done research in Jamaica, and she might also be familiar to those who follow the Digital Media and Learning initiative from the MacArthur Foundation.) She began by crediting Nicholas Long for developing a theory that turned from geopolitics to a focus on relationships with people, which was oriented around the "process of bordering" that recognized both the "effective charge and powerful symbolic weight" of borders and their porousness. She also cited the work on seemingly invisible infrastructures done by the late Susan Leigh Star, Paul Dourish, and Genevieve Bell. She described how the portable kit study, which was conducted by Mimi Ito and a team of many others examining young urban professionals in Tokyo could be useful to those studying social interactions in the developing world. As an anthropologist, Horst enthused about the richness of interviews in which people were engaging with these objects. The IMTFI studi focused on objects that people carry with them with and across border, such as clothing, jewelry, mobile phones, and motorbikes. She also discovered a number of people who kept symbolic money on their persons as they crossed the border. She linked these crossborder activities and communal organizations to the traditional formation of Lakou in Haiti that determined the sharing of food and money, along with religious observance, and also served as a unit for making decisions. Horst argued that mobile phones played a key role representing a process of disembordering and facilitating social support, as well as a sense of care and belonging in the modern day Lakou of "plastic objects." Erin Taylor handled the second half of the presentation about how people negotiated movement of persons, information, and money between states. However, when the border was closed such people were paralyzed; even if they could technically walk around fence, such transgression was risky and expensive, if you needed to pay bribes. The border Taylor described was porous and not just a fixed line, and she claimed that the legal border was actually the easiest line to cross, since as travelers got closer to Santa Domingo, they encountered more military checkpoints. In arguing for the cultural construction of borders through lived practice, she cited Sidney Minz's "Living fences in the Fond-des-Nègres Region" in which the central figure was an informal fence made of sticks. She noted that money was far more important than passport or visas in making the crossing, since without documentation you could still travel. Employment and self-employment also had its own relationships, including those of patron-client, although Haitians working in Dominican households might be criticized by neighbors for not profiting as entrepreneurs at the border markets instead. In this "cross-border arbitrage," ideas about power and privilege were hard to reduce to class or race, especially given the broader material and cultural context of relationships in the border space that the border produces. Thanks for post a great article and great stuff in your post.